For tempering: - heat oil in a small pan and add mustard seeds.When they pop up add red chiles and curry leaves and fry it for a minute. Remove from heat and pour over the Pachadi. It will be a little sweet pachadi. Hmm-- the pineapple pachadi is new to me but looks very tempting and worth trying. also a nice click. Never tried this before,sounds good! The pachadi must be sweeeeeeeeeeeeet with pineapples! Nice and yummy! Sarah, your pineapple dessert looks absolutely delicious, flavourful yet light! Hi Sarah ,Raitha with pineapple is definitely something new to me Picture looks lovely. Very nice dish. Now I have started making PacheDi. ANd will make it soon. This is my favorite! !..looks so tempting! !...very nice click! Wow!!! adipoli aanallo...haven't tried one yet...thanks for sharing. 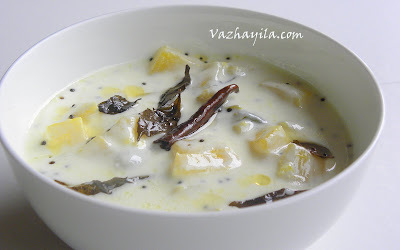 Pachadi looks creamy and gorgeous...never tried pachadis with pineapple..yummy! that's a delicious sweet & sour pachadi; love the combination of yoghurt & the cooked pineapple!! nice pachadi!! Wow............lovely pineapple pachadi dear.........nice click too....sure will try this soon and let u know the outcome. Pachadi looks very tempting..nice click too dear..
Never tried with pineapple..Must be delicious !! I was away for a few days and my have u been busy!! ith okke ingane vayich vazhel vellam varutham enn ellathe enth cheyyana!! and u know what ..this time njaan hopping poyappol i went lookinf for that kada chakka..got it! now have to try out ur recipe! Bookmarking this pachadi. Lovely one. saw this in a TV show....must try....Is this one of the main dish in Kerala wedding? oh is it?? as far as i know pachadi is one among many dishes for the hindu weddings in kerala, but not necessarily pineapple pachadi...usually they serve cucumber pachadi/kichadi..I have not attended many hindu weddings lately..So i m not sure..
Never tried it , just looks so yummy and creamy. Wow, what a unique combination with pineapple, I would love to try it! nice click, Sarah! loved your version without coconut..
That sounds different,but delicious1 I love coming to your blog and leaning new recipes. looks so delightful. Nice idea to add pineapple in yogurt. Beautiful Presentation.This recipe is new to me. But looks delish.I also noted that you have not added turmeric to this dish.So that makes the color of the pineapple pop against the white yoghurt gravy.THis recipe seems easy and I'm going to bookmark it. Looks tangy and would accompany any great meal! This made me remember Pineapple yogurt which is my hot favorite. This pachadi of pineapple seems to be equally delicious. Fantastic.. you and I share the love for pachadi..
Thanx a lot for the wishes Asha and ganga!!! aah.. love pineapple. but never tried this. looks colorful. and beets curry looks yummy too. It looks real yummy, Sarah!Love it! ur blog title is very beautiful. Never tried pachadi with pineapple. It sounds interesting!